Notonecta glauca is the commonest of the back swimming water boatmen. It occurs in a variety of relatively still-water (lentic) habitats including ponds, lakes, canals and ditches. Adults overwinter and eggs are laid between February and early May in plant stems. The five larval stages (instars) take at least two months develop and by July / August mature into the new adult generation which goes on to overwinter, there being only one generation per year. Notonecta spp are highly evolved predators, with a short powerful rostrum (beak-like mouthpart) which can inflict a painful bite if handled carelessly. Prey includes tadpoles, small fish and a variety of invertebrates. The map is based on records from NBN Gateway, with yellow dots showing pre 1990 records, reds dots 1990 – 2015 records and red on yellow dots overlapping records. 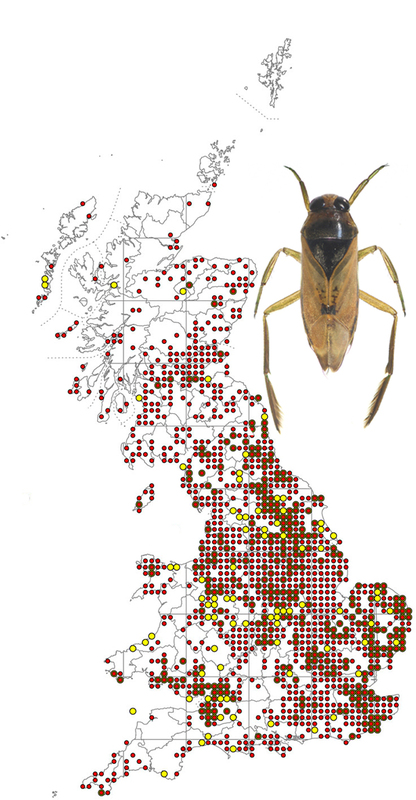 Notonecta glauca is a widespread species both in the UK and Ireland. Notonecta glauca can be distinguished from from N. maculata and N. obliqua by colour and from N.viridis by the difference in the shape of the pronotum, which in N. viridis has finely pointed anterior angles that extend round the lower (posterior) part of the eye.